The company is the noted Manufacturer, Exporter & Supplier of sturdy and highly efficient Pneumatic Cloth Guider. It is one of the most powerful models in pneumatic cloth guiders. It is easy to install as well as operate. 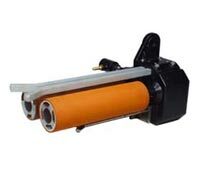 Our Pneumatic Cloth Guider can be easily mounted on an adjustable type support. Moreover, it can be used in vertical and horizontal directions and suitable for dry / wet fabrics. Each set is provided along with an air filter, air regulator, pressure gauge, and pneumatic spiral connection with connector. Adjustable nipping gap from 0 to 10mm for thicker fabric.